Ingo Gerken studied Experimental Painting and Fine Art at the Muthesius Art Academy in Kiel, as well as Environmental Art at Glasgow School of Art, Scotland, UK. He lives and works in Berlin. © Annika Hippler Since 2000, he has had solo shows and exhibitions in national and international art institutions, galleries and project spaces, participation at art fairs and biennials. Also artist residencies in France, England, Ireland, South Africa, Serbia and Russia. His work has been awarded e.g. by Stiftung Kunstfonds and Kunststiftung NRW. In 2010, he received the Fine Art Grant from the State of Berlin. 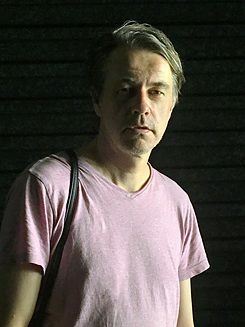 In 2005, he co-founded the Berlin Art & Discourse Space "WestGermany - Büro für postpostmoderne Kommunikation" which enters and activates social-urbanistic contexts with programmes of contemporary art, sound and performance. 2012 winner of the Berlin Award for Artistic Project Spaces, he is a Member of the Artist Collective "Theorie- und Praxisgemeinschaft Fahimi" projects and performances in public space. Since 2013, he has several co-conceptions, architectural designs and interiors of sacral spaces in the team of German artist, Gabriele Wilpers. Since 2011, Ingo Gerken lectures at art schools and universities, most recently in the Department of Architecture & Urban Planning at the University of Kassel. His artistic work approaches space and situation for site-specific arrangements and interventions. He creates sculptural gestures, which keep the balance between banality and the sublime. The ambivalence between high and low, reference and relevance, situation and subversion is a key moment of his work. It is generally based on observations of everyday life, urban rules and social patterns. It questions the intentional structures of object and space, the logics of architecture, place and site. Gerken is interested in the limits of space (overload/emptiness) and alternative concepts of use (improvisation/ improvement). In Bangalore, he is looking for gaps between the absurd and the authentic, the perspective difference between functional effectiveness and an improvised situation. He examines everyday life and normality for their artistic potential, investigates states of the unknown, the unexpected, and the fragility of regular circumstances. He wants his observations, records, finds and manipulations to interact invasively with the public space and to keep in touch with the street life through sculptural events. It took me two full weeks to arrive in Bangalore. And even a few days more before I could start to think about an art project. It just needed some time to fit into the new situation, to accept the different way of living and to get rid of existing convictions, concepts and former perspectives. I felt busy and stressed with finding access to this city, which seemed to be overloaded with an unknown intensity. The Goethe programme welcomed us warmly and shipped us to a range of cultural hot spots in the city. We met visionary people, official partners, activists, initiatives, collectives, artists and architects, who shared with us their inside views and talked about their ideas, achievements, problems and solutions. The schedule was straight forward, and of course, apart from our private trips and explorations in the city, we spent some extra time in bed with fever, sickness and stomach irritations. Nevertheless, this wonderful package of useful information and inspirational overviews made it quite hard to get into a personal flow towards an own rhythm, own experiences and own ideas. More and more I realised that six weeks in Bangalore would be over soon. I started to walk through the city taking hundreds of random photographs without special motives and out of focus. I just pressed the button without looking through the lens, just blind shots out of the pocket. It seemed just impossible to concentrate on something, even to see anything and to picture it properly. There is too much to see, you can’t recognise anything. And the narrow streets of Chickpet were too busy to rest somewhere. Everything moves, changes and flows constantly. And it felt quite uncomfortable to stop for a moment just to look at the scenery from a step outside. You just can’t get any distance, you are always in the middle of the crowd. Every attempt of pausing and relaxing meant an interruption of this floating movement and was even more stressful than to swim with the stream. I felt the vibrancy of this place, this different concept of the public, the power of the masses. No tourists, no flaneurs. Everybody had to do something, was part of some business, belonged to this spot. All the people were here for a good reason. Except me. I was just lost. But I knew I wanna do an art piece exactly here, in the centre of this chaotic flow, but I had no clue what it could be. From this moment on I saw potentially sculptures everywhere. I started to experiment with all kinds of fruits, vegetables, eggs, etc. which I found in the busy city market. Actually here in the market, on improvised tables and in the dust, they were already piled up like astonishing geometric sculptures, like shiny, fresh and colourful pyramids, squares and polyeders. Like a contest of natural symmetry, minimalism and abstract perfection, proudly presented and carefully displayed by professional sellers. The mess of the city market turned into a secret art fair. And I wanted to take part in it with a public sculpture. But what can you add here, what gesture can be the right one, coming from Europe to India as quite a privileged artist, generously supported by a cultural institute? How to handle this situation, this adventure? How to celebrate this special opportunity, this chance to work here and to learn from a different reality in a foreign context? What are the dimensions, the risks, the problems? Who needs my view, who wants to know about my personal struggles, my thoughts and questions here? I haven't found answers, but at least I realised something and found spontaneous help and advice from many people in the streets and shops and from some boys from the neighbourhood. The project led me through the entire city searching for the right material. I built something big and light and shiny. It mirrored its surrounding, absorbed it, split it into pieces and reflected the colours in all directions. It was something to carry around. It moved through the city in different ways, it caught the sunlight and the darkness. Absurd and spectacular on the one side, nearly invisible on the other. Something like a meteorite from outer space, a crystal, a kaleidoscope, a geometrical figure, a perfect and universal form. Some basic structure, but complicated and strange at the same time. I called it “Platonischer Antikörper” and I’ve just thrown this sculpture into the flow, like a paper boat riding on a wild river.